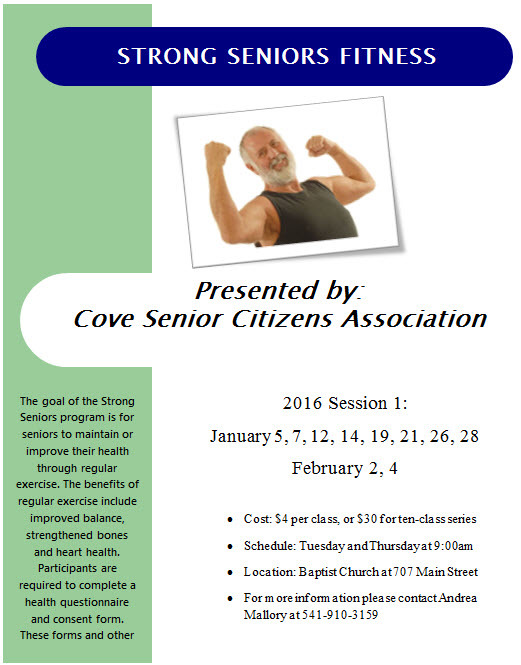 Our first Strong Seniors Fitness program starts tomorrow, January 5th, and we have great news about a new walking program in the works. We are partnering with the Cove School District to offer a free, self guided walking program on Mondays and Wednesdays between the hours of 8:00 am and 10:00 am. The district has graciously offered to open up the old gym to provide residents a safe location to walk during the winter months. Gym appropriate shoes are required. Please contact Andrea Mallory at 541-910-3159 for more information.